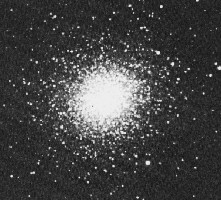 Globular cluster Messier 2 (M2, NGC 7089) was discovered by Maraldi on September 11, 1746. Charles Messier independently rediscovered and cataloged it exactly 14 years later, on September 11, 1760, as a "nebula without stars." William Herschel was the first to resolve it into stars. M2 has a diameter of about 175 light-years, contains about 150,000 stars, and is one of the richer and more compact globular clusters, as its classification in density class II indicates. This cluster is of notable ellipticity (ellipticity 9, or form E1), as can be noted in our photograph; it is extended in position angle 135 deg. At about 37,500 light years (according to W.E. Harris' database), it lies well beyond the Galactic Center. Visually it is of apparent magnitude 6.5 and about 6 to 8 minutes of arc in diameter, with a bright, compressed central region of about 5'. On typical photographs it can be traced to about 12.9 arc minutes, and deep photos reveal that it extends out to a diameter of 16.0 arc minutes. 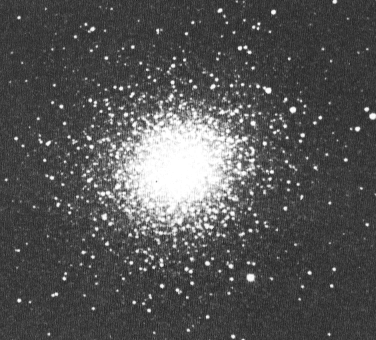 As most globular clusters, M2's central part is pretty compressed: The dense central core of globular cluster M2 is only 0.34 arc minutes or about 20 arc seconds in diameter, corresponding to a diameter of 3.7 light years. Its half-mass radius is 0.93 arc minutes (56 arc seconds, or 10 light years linearly). On the other hand, its tidal radius is large: 21.45 minutes of arc, corresponding to a radius of 233 light years beyond which member stars would escape because of tidal gravitational forces from the Milky Way Galaxy. M2's brightest stars are red and yellow giants of magnitude 13.1, while its horizontal branch stars have an apparent brightness of 16.1. The cluster's overall spectral type has been given with F0, its color index as -0.06; modern values are spectral type F4, B-V = 0.66. From its color-magnitude diagram, Halton Arp (1962) has estimated the age of M2 as about 13 billion years and to be about the same as that of globular clusters M3 and M5. Of its 21 known variables, the first two have been discovered by Bailey in 1895 (Pickering and Bailley 1895), and a total of 8 until 1897. Most of them are so-called "cluster variables" of RR Lyrae type, with short periods of less than a day. Three of them, however, are "classical" Cepheids of type II (W Virginis stars) with periods of 15.57, 17.55 and 19.30 days respectively, and an apparent visual beightness of about 13th magnitude. These stars have been studied by H.C. Arp (1955) and G. Wallerstein (1970). One variable is a RV Tauri star whose apparent magnitude varies between 12.5 and 14.0 with a 69.09 day period; this star has alternating deep and shallow minima, and was discovered in 1897 by the French amateur A. Chèvremont. It lies at the eastern edge of the cluster, slightly toward the North. M2 is approaching us at the low velocity of 5.3 km/sec. Situated in the Galactic halo, it has been classified as an "H2" halo globular by Woltjer (1975) and Nincovic (1983); the latter estimating its orbital excentricity at 0.60. To determine its orbit within the Galaxy, the position with respect to the Galactic center, and the space velocity of the cluster must be known. As its radial velocity is considerably well determined, an appropriately acurate determination of the globular cluster's proper motion is crucial to estimate its space velocity. An estimate from its motion with respect to background galaxies has been undertaken at Lick Observatory (Cudworth and Hanson 1993), as 0.41 and 0.22 arc seconds per century, or 4.1 and 2.2 mas/yr in RA and Dec, respectively. Dauphole et.al. (1996) have assumed these values to be +5.5 and -4.2 mas/yr, and calculated an orbit with excentricity e=0.67, an apogalacitc distance of 91,000 light-years, and a maximal elevation above and below the galactic plane of 78,000 light-years. Geffert et.al. (1997) have obtained improved values for its space motion from data obtained by ESA's astrometric satellite Hipparcos, and Brosche et.al. (1997) have calculated an orbit for this and other globular clusters. According to these calculations, M2 is moving on a highly excentric (e=0.76) orbit of box type, with a perigalactic distance of 23,500 light-years, which carries it out to an enormous apogalactic distance of 171,000 light-years, and up to 165,000 light-years above and below the Galactic plane. M2 is found rather easily from Alpha and Beta Aquarii, as well as Epsilon Pegasi. It is 5 degrees north of Beta Aquarii, on the same declination as Alpha Aquarii. With its visual magnitude of 6.5 mag, M2 is a difficult object for naked-eye observing (just not visible under "average" conditions), but an easy target for the slightest optical aids like binoculars or opera glasses, in particular as it is situated in a star-poor field. A four-inch obstruction-free telescope (refractor or schiefspiegler) doesn't resolve this cluster, but only shows some of the brightest member stars spread over the mottled nebulous background image caused by the unresolved stars. Observing with his 4-inch refractor, John Mallas reports a dark curving lane feature crossing the north-eastern corner of the cluster, which can also be found in photographs. With an 8-inch, this globular cluster is partly resolved into stars, well into the center under good viewing conditions. Larger scopes, 10-inch up, are required to fully resolve this cluster. A peculiar dark lane crosses the north-east edge of the cluster, suggestions of which are visible in our image; larger telescopes (16-inch up) show several other, less prominent darker features or regions. William E. Harris, 1996. Catalogue of Milky Way Globular Cluster Parameters. Astronomical Journal, Vol. 112, No. 4, pp. 1487-1488 (October 1996) [ADS: 1996AJ....112.1487H]. Revision of February, 2003. Available online (local copy of data file and reference file). Also note our Milky Way Globular Clusters online catalog using these data.